Haywood is a non-starter for 20 NBA teams. I can’t exactly blame someone for making such a silly, uneducated statement. Not everyone knows everything about all the players in the NBA. The above quote came from a commenter on the San Antonio Spurs blog, Pounding The Rock, in a recent, “My Team Is Better Than Yours: Washington Wizards Edition” post. Established basketball journalists, such as Slam’s Lang Whitaker, don’t seem to recognize/respect Haywood’s game either. In a recent ‘Top 50 NBA Players’ post (naming 10 players at each position), Whitaker left Haywood off his list of top 10 NBA centers. It’s debatable on whether all these players are centers (Okur, Jefferson). It’s also debatable how much better Tyson Chandler is, especially now that he won’t have Chris Paul creating gimmes for him. Camby and Miller, 34 and 33 respectively, are on the downside of their careers, the latter not playing up to his capabilities in years. But whatever … my bias can certainly be coming into play here. So let’s go to my friend, his name is Statistics, but you can all him ‘Stats’ for short. I tend to think that John Hollinger’s PER is a tad vaunted, but still respect him as a statistical mind for the most part. So PER will be used as a measurement. But first I want to put Haywood’s overall contribution to the team in perspective, and focus on his individual stats later. The 2007-08 season was undoubtedly the best of Haywood’s career . It was the first time he played over 2,000 minutes, averaged more than 10 points, more than seven rebounds, shot better than .700 from the FT line, and had a PER above 18. 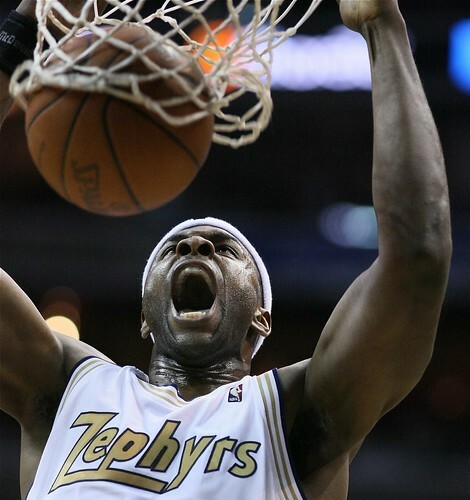 If you want to read more, you can go check my ’07-08 evaluation of Haywood, and another post entitled, “2007-08: Brendan Haywood Breakout or End To A 3-Year Slump?“. But in early October ’08 during training camp, Haywood experienced a freak injury to his wrist and missed all but six games. The Wizards’ defense suffered horribly. Gilbert Arenas plays 13 regular season games in ’07-08 and the Wiz still fight their way to 43 wins and a fifth seed in the playoffs. Both Arenas and Haywood miss most of ’08-09 and the Wizards finish with a catastrophic 19 wins, tying the franchise worst for an 82-game season. Uh yea, Haywood is pretty damn important … especially in terms of his defensive presence, patrolling the paint and communicating defensive positioning to his teammates. Just look at these defensive number differences between 2007-08 and 2008-09 (stats from 82games.com). Haywood’s significance is nothing new to most Wizards fans, but not everyone is a Wizards fan. Ok, back to Haywood’s individual numbers. Let’s see how many players, during Haywood’s career best ’07-08 season, played more than 1,750 minutes, averaged more than 25 minutes per game, had a PER greater than 18, AND primarily played the center position. What does this all mean? Well, not much. It means I can input some parameters into Basketball-Reference.com and get it to spit out some results. What this post indicates is that Haywood, especially in a contract year, really has a chance to cement himself as a top-tier NBA center; one of the top five in the Eastern Conference as I’ve been touting. And by my calculations, Haywood would start for half the teams in the league. A questionable case could be made for two-thirds of the remaining half … but I’ll leave it up to you to guess which teams. Second to the upcoming season being dependent upon the comeback of the nouveau recluse Gilbert Arenas, is the reliance on Haywood to anchor a team of inferior defenders. He’s proved himself worthy before. Now he has to build upon that.